Porto is an ever-inspiring and creative city. But Campanhã area is certainly not the first that comes to a cultural wanderer’s mind. Yet, there is a gem there that I only recently discovered. A short film festival was my pretext to finally visit Espaço Mira and Mira Forum, two adjacent former warehouses that now work as artistic spaces. One is primarily an art gallery, the other is multi-functional and has a commercial component (offers a possibility to rent the space for book presentations or exhibitions – we all have bills to pay, after all). I arrived a bit ahead of projection time, knowing that Mira pursues more than one initiative at a time and curious to peek into the exhibition spaces. What a warm welcome we had by Manuela Monteiro, who lead the visitors throughout the ongoing exhibitions! Together with João Lafuente, she created Mira three years ago, in October 2013. They uncovered the potential of the row of abandoned warehouses in Rua de Miraflor, that even played a part in their families history. Former storage spaces for coal and wine were converted into spaces of culture with a lot of respect and sensibility. One of the current exhibitions in Mira lead me to learn important facts about the cultural landscape of Algarve and the threat of complete eradication it has been exposed to because of the aggressive oil extraction initiatives. The initiatives have been stopped for now, but drawing attention to the problem is of huge importance. With its engagement, Mira gives hope that art may be able to save the world! Last but not the least, the Mira experience inspired me to share a (holiday) thought: all we need is less. A really useful link, the timeline was developed by the company named Sistemas do Futuro, that operates in linking new technologies and heritage. It seems that Lisbon metro is much more than just an infrastructure that gets you efficiently from A to B. Among a number of artists who were commissioned to give their touch to the metro stations there ever since 1950s, the biggest scope of work belongs to the lady named Maria Keil. 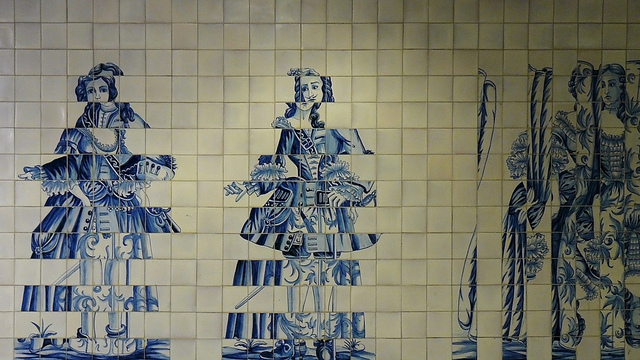 Her work was particularly important for reintroduction of interest in azulejo in the contemporary context, since it was not so much used in the 19th and first decades of 20th century. Another artist who also had commissions from the Lisbon metro company turns out to be particularly interesting for me: Eduardo Nery (1938-2013). Nery was working with decomposition of historical azulejos and these panels can be seen at the Campo Grande metro station. Those works are from the 1990s. The same line of thought was developed at his panel for the EPAL building in Lisbon, from the same period. 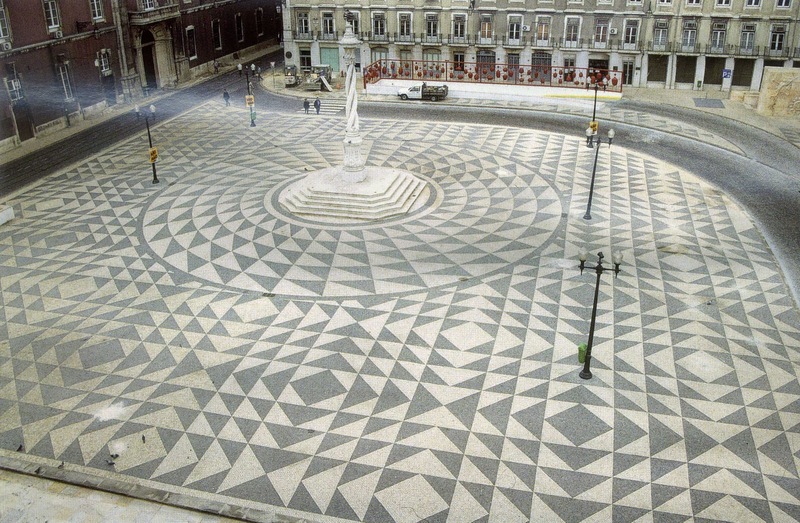 Here I also enclose a photo of Praça da Município in Lisbon (he was very active with his interventions in public spaces). 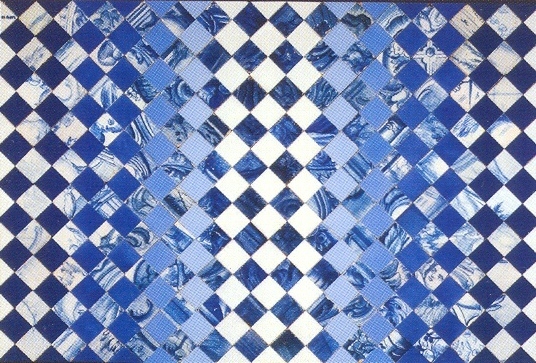 In this work from 1997-1998 period, he merged his Op-Art background and the possibilities of traditional calçada portuguesa (the cobblestone paving). Something to be researched in detail in the future, I think. 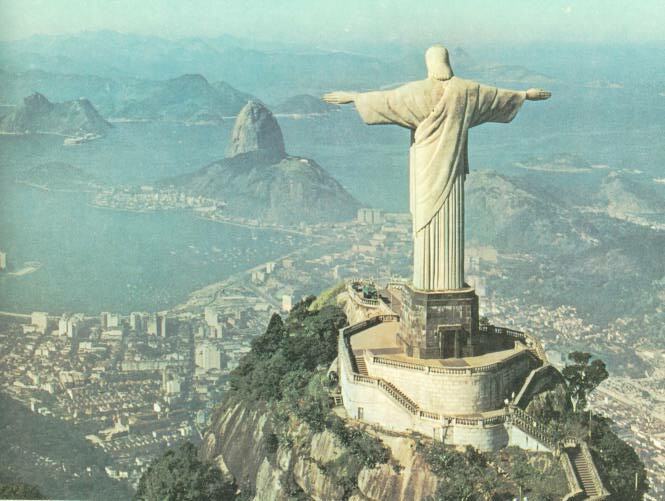 Another pair of twins I know of: the Brazilian and the Portuguese Cristo Redentor. The Brazilian Cristo Redentor in Rio de Janeiro was built between 1922 and 1931. The idea, however, goes back to mid-19th century. 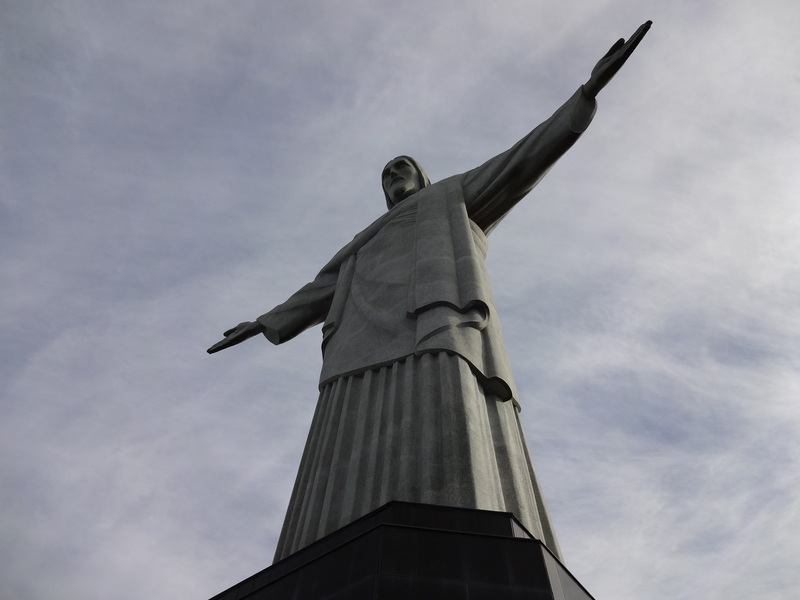 The Christ’s statue is 30 meters tall, and standing on an 8 meter tall pedestal. His open arms symbolize peace. The statue is a work of Heitor da Silva Costa (Brazilian engineer responsible for the design) and the sculptor Paul Landowski.The location is breathtaking – at the top of 700 m tall Corcovado mountain, overlooking entire Rio. I was lucky to visit it personally twice, in 2001 and this summer of 2013! 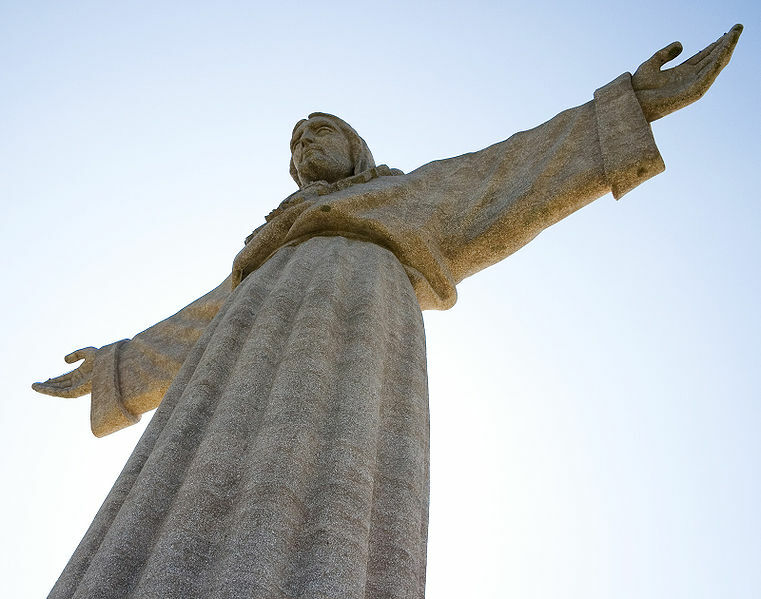 The Lisbon statue was built upon an idea of the Cardinal of Lisbon, after his visit to Rio de Janeiro in 1934. The construction was approved in 1940, and it has to do with Portuguese gratitude for being spared of the devastating effects of WWII. However, the construction lasted between 1949 and 1959, when the statue was inaugurated. The chapel, which is also a part of the monument, was only inaugurated 25 years later, in 1984. 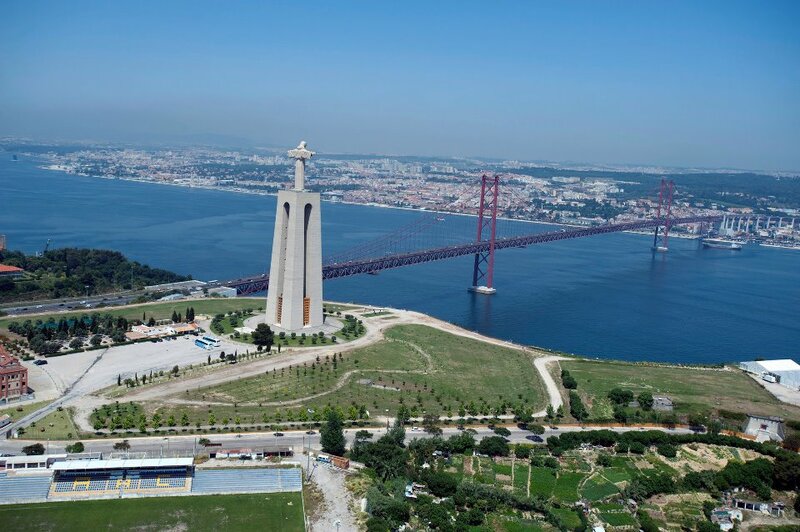 The monument is situated in the municipality of Almada, at an elevated position at the left bank of Tagus. The 82 meters tall pedestal was designed by architect António Lino, while the 28 meter high statue made of concrete was the work of the sculptor named Francisco Franco de Sousa. A detail from my first and so far only trip to Lisbon in summer 2010. 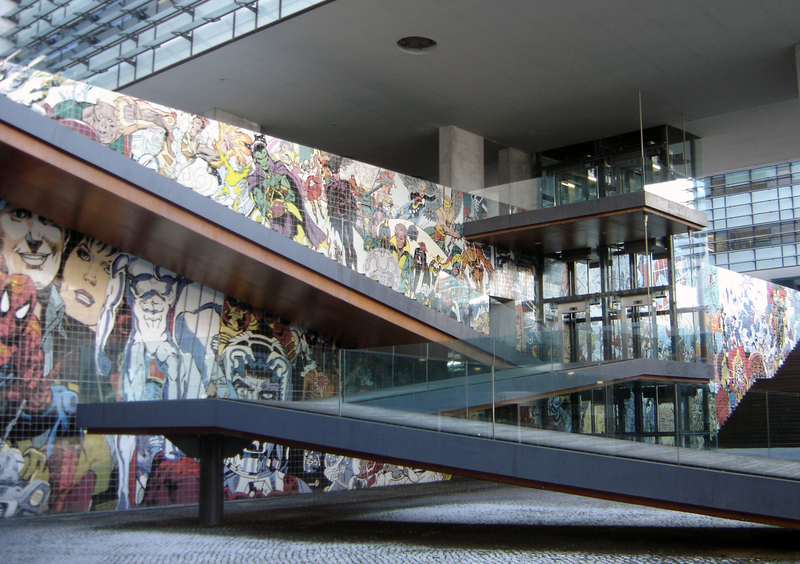 A vast and otherwise grey public space (the ministries district, I think) was cheered up with this artist’s intervention – a contemporary twist of the traditional azulejo panels. The hand-painted glazed tiles comprise a mural that represents some imagined superheroes of our age. Trafaria Praia (2013) is the project of Joana Vasconcelos that represented Portugal at the 2013 Venice Biennial. 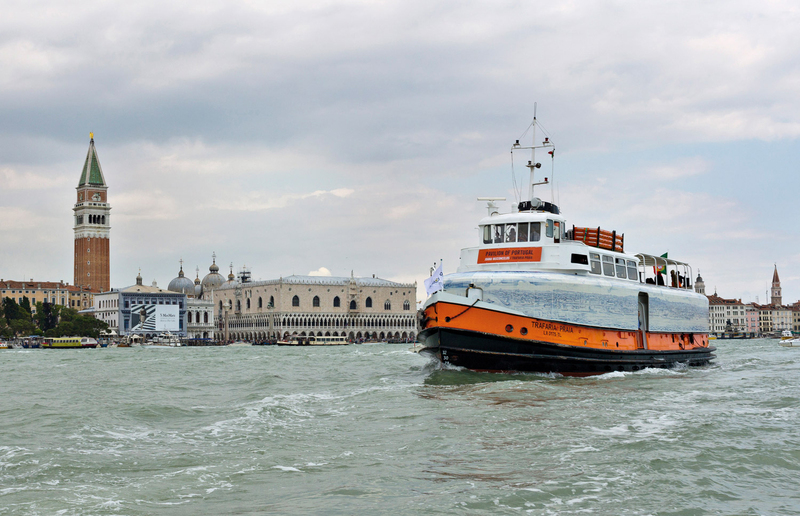 Trafaria Praia is a real cacilheiro, the ferryboat used until 2011 to cross the river Tagus and link southern suburbs with the rest of Lisbon. In this complex project, the artist examines historical links between Portugal and Italy, meaning of cacilheiro as a social and class symbol in Portugal, as well as the interplay of tradition and contemporaneity, which is of relevance for my research. 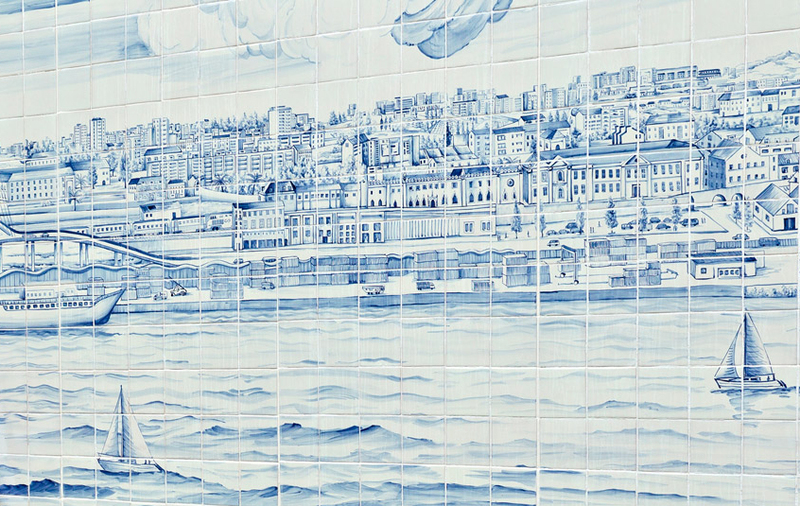 The picture shows a detail of her panel of azulejos depicted on the outside of the ship: a panorama of today’s Lisbon, inspired by the famous Great Panorama of Lisbon which evokes the golden age of azulejo production.